New York City is known for museums, nightlife, shopping, historic sites, and parks. Your plan includes some of its best attractions: take in the pleasant sights at Central Park, explore and take pictures at The High Line, snap pictures at Brooklyn Bridge, and explore the world behind art at The Metropolitan Museum of Art. To see other places to visit, maps, reviews, and tourist information, use the New York City itinerary builder tool . Oslo, Norway to New York City is an approximately 12-hour combination of flight and bus. You can also fly; or do a combination of flight and train. The time zone difference when traveling from Oslo to New York City is minus 6 hours. Traveling from Oslo in July, expect nights in New York City to be warmer, around 26°C, while days are somewhat warmer, around 35°C. Cap off your sightseeing on the 17th (Wed) early enough to travel to Volcano. Get out of town with these interesting Volcano side-trips: Hilo (Rainbow Falls, Akaka Falls State Park, & more). The adventure continues: hike along Kilauea Iki Trailhead, see the interesting displays at Jagger Museum, get impressive views of Kīlauea, and stroll through Devastation Trail. To find where to stay, maps, and other tourist information, use the Volcano trip maker site . The Route module can help you plan travel from New York City to Volcano. The time zone difference when traveling from New York City to Volcano is minus 5 hours. In July, daily temperatures in Volcano can reach 34°C, while at night they dip to 25°C. Finish up your sightseeing early on the 21st (Sun) so you can go by car to Waimea. A vast agricultural land with one of the largest cattle ranches in the United States, Waimea embraces its ranching roots. 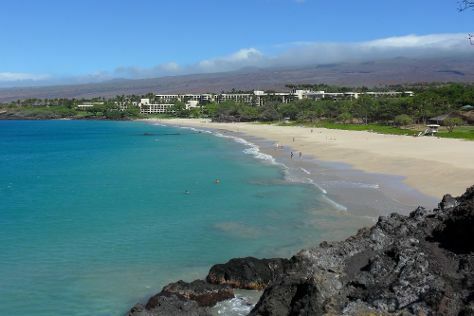 Start off your visit on the 21st (Sun): explore the wealth of natural beauty at Puukohola National Historic Park, look for gifts at Waikoloa Beach Resort, and then enjoy the sand and surf at Hapuna Beach State Recreation Area. On the next day, admire all the interesting features of Saddle Road and then get close to the beloved marine mammals with a swim-with-the-dolphins experience. For ratings, maps, other places to visit, and tourist information, read our Waimea online day trip planner . Getting from Volcano to Waimea by car takes about 2.5 hours. Other options: take a bus. Traveling from Volcano in July, expect nights in Waimea to be colder, around 11°C, while days are slightly colder, around 26°C. Finish your sightseeing early on the 23rd (Tue) so you can travel to Honolulu. Change things up with these side-trips from Honolulu: Haleiwa (Waimea Bay & Sunset Beach Park), Pu’u O Mahuka Heiau State Monument (in Pupukea) and Lanikai Beach (in Kailua). Next up on the itinerary: explore the different monuments and memorials at USS Arizona Memorial, enjoy the sand and surf at Waikiki Beach, savor the flavors at Food & Drink, and take in the dramatic scenery at Manoa Falls. To see photos, traveler tips, where to stay, and tourist information, go to the Honolulu trip maker . You can do a combination of taxi and flight from Waimea to Honolulu in 4 hours. Alternatively, you can do a combination of bus and flight. When traveling from Waimea in July, plan for somewhat warmer days in Honolulu, with highs around 36°C, while nights are much warmer with lows around 28°C. Wrap up your sightseeing on the 29th (Mon) to allow time to travel to Las Vegas. Step out of Las Vegas to go to Boulder City and see Hoover Dam, which is approximately 50 minutes away. There's lots more to do: admire the local landmark of Bellagio Fountains, see the interesting displays at The Mob Museum, admire the natural beauty at Bellagio Conservatory & Botanical Gardens, and buy something for everyone on your list at The Grand Canal Shoppes at The Venetian. To find other places to visit, traveler tips, maps, and more tourist information, you can read our Las Vegas trip itinerary planning tool . Getting from Honolulu to Las Vegas by flight takes about 9 hours. The time zone changes from Hawaii Standard Time to Pacific Standard Time, which is usually a 2 hour difference. In July, Las Vegas is somewhat warmer than Honolulu - with highs of 47°C and lows of 32°C. Cap off your sightseeing on the 3rd (Sat) early enough to travel back home.